A homeowner takes the city to task about results of construction in his addition. The council meetings keep getting shorter and shorter. The one on Monday evening, March 18th, lasted less than 18 minutes. The council members were all present and voting except for Vice-Mayor Lou Martin, Jr., who was absent. The Public Comment came from a disgruntled landowner from The Lakes at Cross Timbers, Kenneth Ayres. A few months ago, the Sapulpa Metropolitan Area Planning Commission and later, the City Council members approved the beginnings of construction for a connected subdivision, against the vociferous objections of many members of the Homeowners’ Association. The bottom line for the commission and council is that if what is asked is legal, it will more than likely be passed. 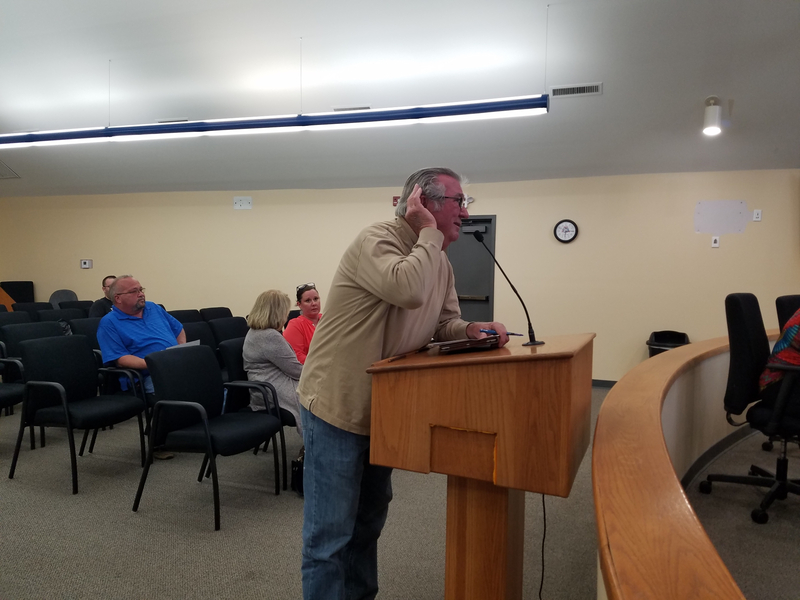 Mr. Ayres was visibly upset, first of all that he couldn’t hear the proceedings and he made sure to remark that under the Americans with Disabilities Act, the Council was required to provide microphones for people to hear. He said “just turning the volume up doesn’t work,” and that the Council was not in compliance. Several times, Mr. Ayers cupped his ear with his hand so he could hear questions or answers from the councilors. He asked what the plans are now, since they have changed from “what the city voted ‘yes’ on.” Mr. Ayres said he had an agreement in writing and that the homeowners had not received any communication from the construction company. He showed the members of the council several pictures of the damaged pond, which he had taken on Monday morning. He said construction equipment was left on a communally-owned area of the subdivision. He challenged the council to help the homeowners. Consent Items approved included Claims in the amount of $449,691.56 and Prepaid Claims in the amount of $5,632.00. Office Express Janitorial Services were approved for janitorial services at the Senior Center (for $850.00 a month) and at Booker T. Washington Recreation Center ($995.00 a month) both beginning on April 8, 2019. There was also an agreement approved from the United States Department of Agriculture, Services, Wildlife Services Division, to provide wildlife damage control services in and about the city lakes and park land at a cost of $4,375.00. A Quit-claim Deed was approved for Lee and Maple, LLC, for an old alleyway that is closed and hadn’t been used since the 1960s. It may be best known as the old “Stuart Lumber” property on East Lee Avenue and is located under the building of the present-day Nale Realty Company and CrossFit gym. A recent title search found the 10 foot by 25 foot plot of land that the city has owned since the 1940s and forgot about. The Sapulpa Municipal Authority meeting approved Consent Items and adjourned in less than two minutes. Soon there will be “discussion and possible action” on three new Medical Marijuana Dispensaries, a new Clinic, and a Grow site coming up for consideration. The next City Council meeting will be held on April 1, 2019, beginning promptly at 7 p.m. in the City Hall Council Chamber.